Celeris Forums • View topic - SUGGESTIONS FOR VP4 ONLINE. Ideas or questions on a new tournament system. Re: SUGGESTIONS FOR VP4 ONLINE. It would be nice to see the "walk back" key working imediatly after our shots. A way zo zoom out very quck. I love "walk back" key. AlytPool wrote: It would be nice to see the "walk back" key working imediatly after our shots. A way zo zoom out very quck. I second that, "walk-back" is a great feature. Though I use it mainly to be able to see the entire table from about the same angle than I'm intending to shoot. So I zoom out and view from further on top, very useful to visualize difficult routes, safeties, and in general for 3-cushion. However, when using it several times on the same shot, you've to redo the viewpoint changes every time. Therefore I vote for having "walk-back" keep its last viewpoint, just like normal view does when "last distance" is set. PS I'm not sure if that was actually filed as a bug, but after releasing "W" (aka the walk-back key), sometimes you lose control of the cue, as if you had pressed "V". Although this happens to me basically every day I play, because I use "W" on almost every shot, I still haven't figured out a pattern when this occurs. Some matches it doesn't at all, some others it happens every time. It would be great if that could be sorted out, and I'm very much willing to assist / collect data, etc. Here's something that not everybody reading this thread might have read. While you read about it, keep in mind the slogan "So realistic it will make your real pool game better!". Please, Steve, consider it at least as an optional feature. I'm very sure this will be appreciated by a lot of players. How about increasing the realism yet another notch, and enabling the new options as "optional" ON or OFF for friendlies? Here are my suggestions (please feel free to move this into a new topic of its own so we can hear feedback from other members). Annoys the crap out of me to see people rolling balls dead-weight the entire match, just to get easier shape on the next shot, and so balls pot easier (specially for the super-tight snooker pockets we currently have). People that plays snooker in real life knows how hard it is to just roll balls dead-weight for the whole lenght of the table. There are cloth imperfections/dirt, table drift (no table is perfect), and many other reasons. If you try to roll a ball in dead-weight for the whole lenght of the table in real life, you may pot 1 in every 10. Even super-tables like the ones used in World Championships have drifts and imperfections, we've all seen it on the TV. For every 0.5 seconds of ball movement, add a random possibility of change in diretion. So if you play at fast pace and the cue ball takes very little time to reach the object ball, there will be no drift (just like in real life), while if the total travel time is 5 seconds, the cue ball MAY suffer change in direction 10 times during it's travel. This is just the raw idea, the values can be fine-tuned to reflect possible drifts that happen in a real table. I'd be happy to help as much as I can on this matter, feel free to contact me. If you ask any professional "what is the hardest part of potting a ball", he'll probably reply "hitting the cue-ball exactly where you want to hit it". If we want to play plain ball (no spin), we need to hit the center of the white. But even for professionals this is almost impossible. Even if you hit almost in the middle of the white, but just a tad bit to the left, you'll add unwanted spin and unwanted swerve, and even though this is very minor, depending on the speed and distance of the shot, this can be the difference between potting or missing. On VP4, every time we come to the table, the cue is already set DEAD on the center of the white. All we do is hit, and we have 100% certainty we'll pot (as long as the aiming was correct). It's not too hard to add an option to the cue to be positioned on a random part of the white for every time you come to the table, forcing the player to choose where he wants to strike the cueball. Since it's always dead-center, if we want back-spin, all we need to do is to drag the cue tip vertically down, and you still have center ball. But if you need to reposition the cue tip without any basis for center ball (other than your eyes and perception), it would be harder to hit perfectly where you want to, just like in real life. On top of that, would be nice to add a randomly generated deviation to the cue, so you don't hit always exactly as you aimed. The back-swing is what determines where you'll be hitting, so in the back-swing in VP4 we could add a randomly generated deviation, which escalates with the power applied to the shot. Example: For power between 1 and 20% = Random deviation between 0% - 2% from the center. For power between 80 and 100% = Random deviation between 0-40% from the center. Again, these values can be fine-tuned to better reflect real life behavior, and all of these options can be turned ON or OFF, to please the arcade-lovers and the professionals who really want to improve their real life game. I have many other suggestions, if there's any interest I'll be happy to help. I work on the gaming industry, directly with developers (I'm the producer on the publisher side), so I've had many years of experience in the field. I love snooker, and I love VP4. I'm doing all I can to help you guys make this game better, I hope my voice is heard, and if you (yes, you reading) agrees with these points, please leave your feedback. Alone, I can't do anything. And it's hard to drag/unzoom with mouse quick enough to see the entire path of a shot. That type of shot for exemple. Even if you drag the mouse quick, you would miss a bit of the path. deraltefritz wrote: Here's something that not everybody reading this thread might have read. Thanks for sharing, looks like a good idea for players, just bit trouble for the programmer. Though I only agree with table drift part, and this part is what I'm going to say. Before this drift feature, I think we have to assess the problem of jaw rejection first. I posted it on another thread in case of making this thread off-topic. There lacks 1P stats, naturally because of the game itself. I've thought it for a while and finally came up with an idea: Scores. Record the scores in a match and stats them by something like "points lost per game" or "points lost per game won". How many points you lost in a winning game can partly represent how well you play in 1P. It's getting more necessary coz people are making good runs on break. Option to disallow jump shots under game -> advanced. In real life, some house/tournament rules disallow jump shots for particular games, some allow jump shots only with the regular cue (i.e. no special jump cues). Could we get such options ? 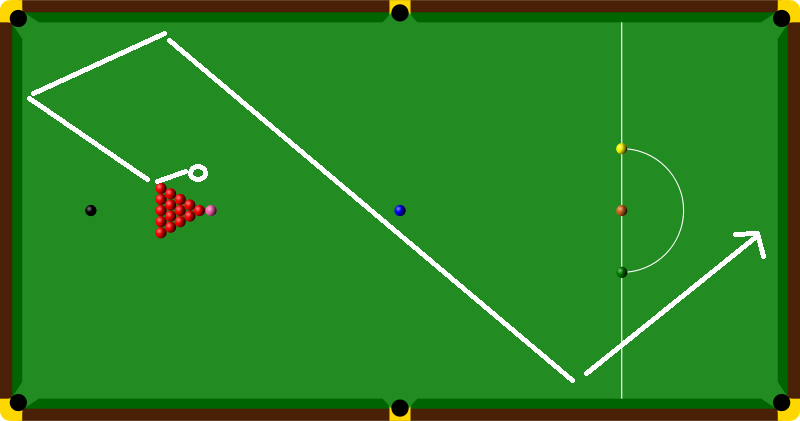 Vote for re-rack in snooker when 5 consecutive turns with no balls touching rail after CB hit OB or potted. Compulsory re-rack when more consecutive turns. Hot keys (keyboard, not mouse) for replay functions. Watching replay is like watching a game, we may like to change view (use "v" - the in-game hot key) sometimes. We also click forward several times in a match replay. It's not convenient now that we have to Alt to use the mouse, and then Alt again to switch back in-game many times. When there are screens like "designate ball on" or "choose pocket" or any other call shot screen, even the other players in the room can't do anything. They see the same cue stick to select things (but obviously can't select anything), and can't type. That could be implemented a bit more convenient, so that other players in the room can continue viewing around and chat. PS URL command not working here? Thanks a lot for the implementation of "foul and a miss" rule in snooker! Is the foul and miss rule now reworked and better implemented ? Since the last update ? What exactly is better now ? Andreas Binz wrote: Is the foul and miss rule now reworked and better implemented ? Since the last update ? What exactly is better now ? Well after testing, some peole noticed it's sometime still related to your rating. We would like to know exactly how it's working since last patch please. How VP4 can change rules without telling us. Sure it is more work to write changelogs but it would better to see what is the difference to the prevous version. Still related to your rating sounds very good. Well now since people cant resign with "escape/resign" (some players not aware about ctrl+R), players just force quit. Sometime they dont really do it on purpose but it's really annoying to battle 30min with someone and not get rewarded by rating points. When the game will be public and crowded, you can be sure that a lot more playerd will abuse of that silly rule. The Russian market isn't too small, and the engine probably already allows for that type of games. And again, table and stroke imperfections. I thought of something, i'm using Google Diary (or calendar) many times a day, there is an option to share public calendar's friend, i thought about sharing tournaments calendar would be cool ! Another point, i found no link of this forum on the vpool portal website, is it somewhere ? There really should be a prominent link to this forum somewhere on the portal. A forum like this is great for recorded discussion and that would drive more people here. For an actual suggestion, I think something should be done to encourage tournament entries. At the moment, most people wait till 5-10 mins before the thing starts. That's fine but I believe most people wait because they want to see roughly how many entries there will be to help decide if it's worth their time. I suggest that, for example, the first 8 people to sign up to a 64 max tourney would receive a 10% discount on the entry fee. Players that decide to sign up in advance get a reduced price and are encouraged to enter and players deciding at the last moment will see a fuller tournament and are encouraged to enter. It doesn't have to be 8 players and it doesn't have to be 10% but you get the idea. I would like to be able to change from player to spectator and back again when in a 'challenge' game without having to leave the room. I would guess that the majority of people cannot play ladder & tournaments every day, so there isn't really a chance for them to get anywhere to the top in the existing leader boards. So why not show a column with "money won minus money spent"? If you have only time to play in one or two tournaments per week, but you get in the money quite often, it would show in that column. Runout from break / break money made / break fouls / racks run are very difficult to compare, as the total number of breaks/racks varies extremely between players. It could be a percentage of that total number, just as Ave Balls Made is.